If there’s one piece of the Roman Empire that has managed to weave its way into popular culture, it’s the army. Every decade or so, we get a new movie featuring the heroics of a Russell Crowe (Gladiator), Clive Owen (King Arthur), or Michael Fassbender (Centurion, which is an awesome action flick), and images of crested helmets, armor, swords, and disciplined troops are a common association for our modern image of Rome. The army of the late Empire was a much different force than the classic legions of Augustus and Marcus Aurelius, though. Following the disasters of the Crisis of the Third Century, when every general got it into his head to declare himself emperor and the barbarians repeatedly invaded, the army had to adapt to survive. It was focused more around troops on horseback than lockstep legions of heavy infantry, and it was divided into smaller, more flexible units. Despite these changes, the army was still the central institution of the late Roman world. Between 50 and 80 percent of the state’s revenue went to funding it. 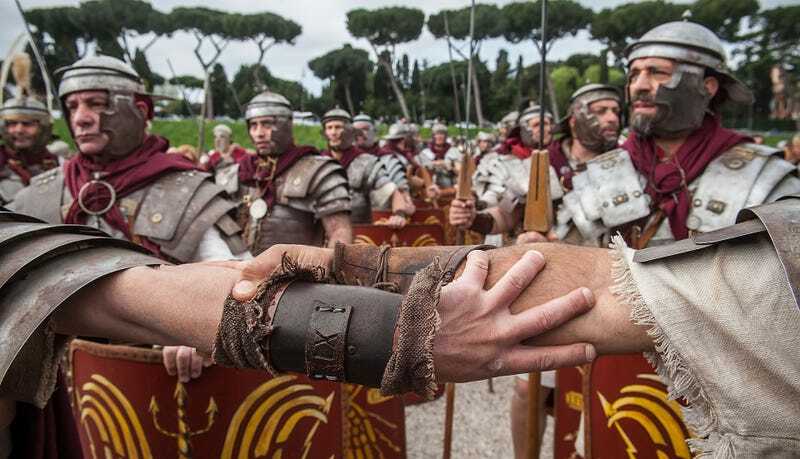 One of every 150 or 200 Romans was a professional soldier permanently under arms. The demands of feeding and supplying it drove the economy of the entire Empire. In the frontier provinces, the army was the center of society and culture, a world unto itself that had its own practices and norms. The frontier culture that grew up around the army melded the Roman and the barbarian into a unique blend that was different from both. In this week’s episode, we look at the late Roman army, how it had changed from that of the early Empire, how it fit into society, and how a soldier might have experienced life in the legions. If that sounds interesting to you, give the tenth episode of The Fall of Rome a listen, and if you have any questions, comments, or concerns, let me know in the comments.